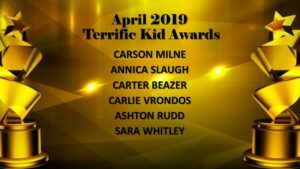 Congratulations to our Terrific Kid Award Recipients for April 2019! Carson Milne is one fantastic kid! Academically, Carson has excelled in all of his classes all year. He takes pride in doing his best work each day. Carson is responsible and hard working. He works well in a group and individually. He also asks great questions and works diligently the entire class period. He has performed particularly well this year in his core subjects; he shows a strong understanding of the concepts. Carson pays attention during class, is respectful and works hard. He is a great writer and always has fun and creative stories to share with the class. All of his teachers appreciate his work ethic and determination to do well on all of his work and the example he sets for the rest of the class. Also, Carson always participates in class discussions and works well with everyone. Carson is a great example to those around him and we greatly appreciated his contributions to class. He is a great athlete who works well with his teammates and shows great sportsmanship when he plays. He has a fun sense of humor and includes others. He makes other students feel comfortable and is a positive influence in any class. He also is such a likable and pleasant person. He always has a smile on his face and a great attitude about the work we do in class. He is respectful and kind to all. When we think of Carson, only positive things come to mind; he really is amazing! All of his teachers feel lucky to have him in class this year. Congratulations to Carlie Vrondros, the 8th grade “Terrific Kid” for April! Carlie is a new student to Riverview this year. Carlie attended Olympus Junior High before coming to Riverview. We are glad you are here at Riverview! All of Carlie’s teachers have commented on how kind and caring Carlie is to all her peers. Carlie goes out of her way to help peers and adults with anything they need help in class. Carlie is a great Peer tutor for students who need the extra one to one help. Carlie has a lot of patience to work with her peers who have disabilities. Congratulations to Carlie, you deserve this honor! Ms. Page: Carter is very conscientious and works hard every day. He is fun to have in class and is a wonderful team player. He is also very helpful. Ms. Baldwin: Carter actually lives in my neighborhood! He has a wonderful family and you can tell that he is a great older brother who loves and cares about his siblings. We are lucky to have him at this school and he is definitely a terrific kid!! Mr. Burton: Carter is always pleasant to have in class. He smiles even when things don’t go his way and never complains. He is always ready to participate in class and is just fun to have around. Ms. Donovan: Carter has been working 100%! He is great to get involved in class discussions and he sometimes reminds ME of what happened “this day in history.” It is wonderful having Carter in class! Ms. Strader: Carter is a wonderful student! I have had the honor of being his School Success teacher this year and he has truly been successful! Carter has shown tremendous improvement in his academics, organization, and time management. He is such a hard worker and always tries his best. He is also very funny and so kind to the rest of his peers. I have loved having Carter in my class and seeing him grow as a student and as a person. He is 100% a Terrific Kid! Ms. Cuka: I have been so impressed with the hard work, enthusiasm, and self-control Carter has shown in German class. On the first day of class, he already knew the German numbers, and he still does extra studying outside of what we do in class. He is always quick to volunteer to read or answer questions, and he often asks insightful questions that allow me an opportunity to clarify tricky aspects of the language to the class. Carter is in a class with numerous disruptive students and so he has learned that when he finds himself getting off task with them, he can step out to get a drink and come back ready to work again. It is rare to see this kind of self-monitoring in an eighth-grade student. To top it off, he is such a good sport that he was willing to be the Fairy Godmother and wear a tutu in our German play! It is wonderful to have a student with such a positive attitude and who is willing to work hard. Ms. Wihongi: I love having Carter in my first period class because I get to start each day with his positive attitude, big smile, and enthusiastic personality. He always has such great insights in our class discussions and knows so much when we discuss our class novels from different periods of history. Carter also is so service-oriented; he helps me keep my books and class materials organized, and he is always willing to haul materials back and forth between Ms. Strader’s and my classrooms. It is not that common to see such kindness and selflessness in 8th graders, but Carter truly IS a kind and selfless person who makes this school a better place. It has been such a joy to have Carter in my English class this year; our class definitely wouldn’t be as fun without him. Congratulations, Carter! Your teachers are proud of you and appreciate the amazing young man that you are here at Riverview! Ashton Rudd has been chosen as the 9th grade Terrific Kid for April! He was chosen because of his hard work ethic, kindness to others, and positive attitude. He will always go out of his way to smile or say “Hi” to others in the halls and in classes. He works hard to complete his assignments and never complains. He is quiet and shy, but will get up in front of class and talk even when it is difficult for him. Ashton is one of the most dedicated students we have here at Riverview. He works constantly and strives to do his best at everything he is assigned to do. He is tenacious in his effort to understand the material. He is always on task and works harder than any other student. Ashton is never unkind to anyone. He is one of the friendliest, sweetest, incredibly thoughtful students we have at Riverview. He always has a smile on his face and will help others around him in a very kind way. He has a great sense of humor! He is well respected and liked by the other students because of his willingness to be a friend. Teacher really enjoy working with Ashton because he is respectful and polite and will strive to understand the concepts taught. Ashton is the perfect choice for our Terrific Kid award. He is a wonderful example of someone who is hard-working, dedicated, caring, positive, friendly, brave, and respectful. He makes Riverview a better place for anyone who knows him. What a terrific kid!! It is a pleasure to see Sara recognized as Terrific Kid for April.